Hawaii has a history of prioritizing the environment — it has mandated renewable energy use and prohibited sunscreen ingredients that harm coral. 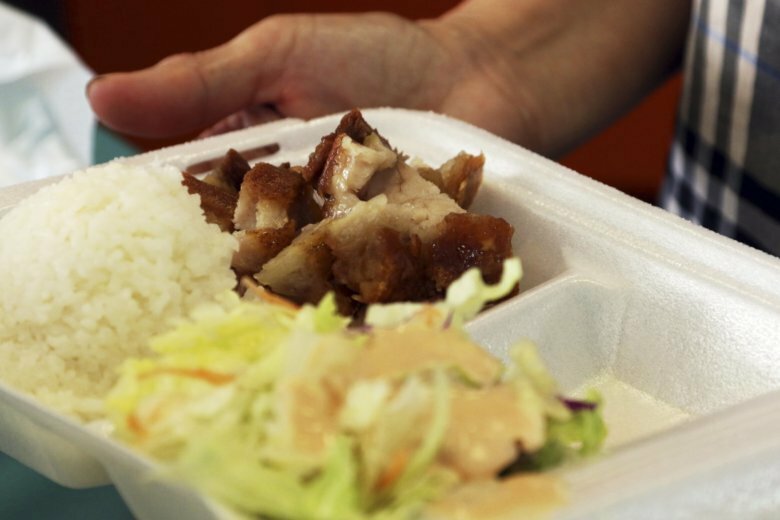 Dozens of cities nationwide have banned plastic foam containers, but Hawaii’s measure targeting fast-food and full-service restaurants would make it the first state to do so. The liberal state has a history of prioritizing the environment — it’s mandated renewable energy use and prohibited sunscreen ingredients that harm coral. He said he’ll have to raise prices. “Now all of the sudden, your family’s $30 dining experience became $37 or $38,” Wong said. Yankowski, who is also president of Triple F Distributors, argued that good alternatives to plastic products are not yet available. Hawaii’s cities and counties also don’t provide composting facilities, so there is no organized place to dispose of compostable containers that lawmakers say restaurants should use instead, he added. “It’s almost like we want to do great things for the environment, but we’re not ready to handle it when we change it over,” Yankowski said. The Hawaii Food Industry Association, which counts the state’s biggest supermarkets and convenience stores as members, initially opposed the foam container ban but now supports it. The group said in written testimony that it’s encountered difficulties coping with varied local regulations and it wants the state to create a consistent standard. Two main counties — Hawaii and Maui — have already adopted plastic foam bans. Maui’s took effect on Dec. 31, while Hawaii’s takes effect on July 1. Grocery stores wouldn’t be able to sell trash can liners, Adrian Hong said in written testimony. It would create a “public health crisis,” he said. Cindy McMillan, a spokeswoman for Gov. David Ige, said he hasn’t stated a position on the measures yet. “It’s definitely something that’s got to go,” he said, after eating a sandwich from a foam takeout box.